All right, so here's my issue. My IE7 (internet exploerer 7) died a while back, so the other day I downloaded and installed IE8. It mostly works. When you go to this site: http://msdn.microsoft.com/en-us/dd441788.aspx it has down in the list of incompatible things, and Sonic Solution's DriveLetterAccess is one of them. I use my DLA, I rather enjoy it. I don't get what that has to do with my internet browser though. According to that site, all you have to do to end the problem is to turn that add-on off. The kicker is when you DO turn the add-on off, it makes all of IE crash. There's another option that says to always load it, but when you do that, it also makes IE crash. I don't have an answer as to what is happening but would suggest you use another browser such as Firefox. It seems to be referring to DLA as an add-on, but if that's so then what does that last sentence mean, 'that when you disable DLA the main functionality of DLA is unaffected' ?? If that's not what they're saying, then what are they saying?? Can someone translate the Microsoft gobbledygook, please ? They are saying "certain versions of DLA" are incompatible. Which version are you using, and did you find anything saying which versions are compatible or incompatible? I have absolutely no idea why, but the DLA is listed as an add-on. I'm assuming that the "functionality of DLA is unaffected" bit means you're just un-associating it from the browser--why it has anything to DO with the browser is absolutely beyond me to understand lol. So yeah, I haven't found anything about which version are or are not compatible. I'm using Version 5.2.0 build 520B08E (DLD) --and evidently that one doesn't work. I still can't make any sense of that sentence, not can I work out what it should be saying, but Hey! that's Microsoft. Thanks for that information about the version. I've sent you a PM and wonder if you'd like to see if a later version of D2D/DLA is compatible with I.E. 8.
doesn't accept response. Any way to update Drive letter access code to a version that doen't cause this problem. The problem is caused by changes to Internet Exploder, not DLA. Check your private messages. I am curious (not a cat). How in the hell did your browser die? No matter, it doesn't look good for your side, and I would bet that the DLA problem is the least of your troubles. yeah, i don't see it looking so good either. the browser would stop in the middle of anything and would close. at the time we were having a raid-volume thing, but we got that figured out, but IE hates me or something now. And really, with ie8, the DLA thing is the only thing keeping the browser from working. I know this is an old thread, but we're finally getting around to installing IE8 on our XP machines at work and are running into the same message. Has anyone come up with a way to deregister DLA as an IE plug in? Or set a group policy to automatically disable just this plugin? Ups, even 2 years later don't have a solution. You guys are posting to an almost 3 year old thread. There have been at leat 2 or 3 versions of Roxio since then that don't even include DLA anymore because of some of these issues. DLA was never a plug in.It was a built in part of the suite.If I remember correctly you should have been able to chose to not install it at first install. You may be able to uninstall it the same way. You may also be able to go into msconfig and disable it from starting.I can't say for sure as I'm no longer running any of those versions. At best DLA was a sketchy way of saving data. You were better off just writing data to a cd using Creator Classic and redoing the disc if need be. You could always make the disc appendable and add data that way latter if need be. Go do your homework, and quit posting useless posts here, please. I realize this is an old thread. But, we are very slow (obviously) getting to IE8. I was just wondering if anyone had figure out a way, from an enterprise level, to unplug the plug in w/o uninstalling the applicaiton. osborn, Drew has no history with this forum. He may be correct but I would hold off until you get some confirmation of that "fix". Sorry Drew. Just being extra cautious. Thank you for your caution, Steve [sknis]. Executing that MSI command completely uninstalls the whole of DLA, and while completely nuking the application may be fine for 'Drew Guy', and his command line is very helpful for those who do want to uninstall it, it isn't the way to resolve the conflict between IE8 or IE9 and the Sonic DLA add-on 1.0.0.1 for Internet Explorer. I don't normally use IE, but today I spent some time trying all this stuff out [the only way to be sure] and even installed IE7 and IE8 [ugh!]. It turns out that DLA will install add-ons into Internet Explorer, additional to DLA's core functionality. 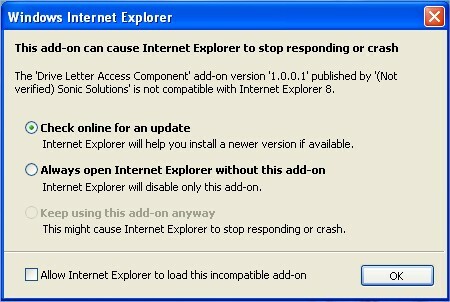 One particular version of the add-on [ver1.0.0.1] is not liked by IE8 and IE9. The main DLA program still works fine, but the add-on won't. When you get a pop-up from IE complaining about the add-on, just click the radio button to always open IE without the add-on. -locate the DLA add-on, right-click on the Status column, and left-click on "Disable"
I hope this helps you, Osborn4. Thanks all for the help. Brendan, your solutions would have been preferable, if I could have implemented them via batch rather than graphical. I cannot ask my 4000 users to each do that. Since DLA is not really used anymore anyway, we decided to go with Drew's solution. Works great. It does completely remove DLA. But I doubt anyone will even notice.